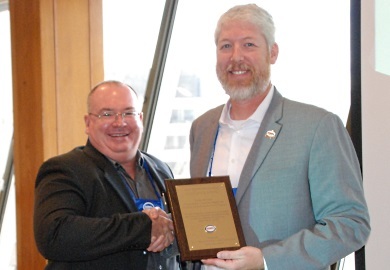 SCDNR's Scott Meister (right) accepts the 2017 State Program Excellence Award from States Organization for Boating Access president Ron Christofferson. Boating culture is strong in South Carolina – and since 2001, one South Carolina Department of Natural Resources (SCDNR) program has sought to improve boating facilities and public access on the state's beautiful waterways. SCDNR's Boating Infrastructure Grant program provides competitive grants to marinas for developing and maintaining recreational boating facilities, funding 25 projects across the coast since it started. Recently, the program was awarded the 2017 State Program Excellence Award by the States Organization for Boating Access (SOBA), which recognizes one state-administered program annually for excellence in improving recreational boating access for state residents and visitors. SCDNR's Boating Infrastructure Grant program coordinator Scott Meister accepted the award this month at the annual SOBA conference conference – and he said it takes a village to run the program successfully. "Our success is based on many sectors of SCDNR working together to secure funding and complete these recreational boating projects," Meister said. "Our grants administration, legal, engineering, procurement, and environmental staff all play an essential role in the program. The success of the program is also due in part to the vibrant recreational boating community of SC and their demand for accessible, high-quality public recreational boating access to the waterways of the state." The U.S. Fish and Wildlife Service's Wildlife and Sportfish Restoration Program, which administers the Boating Infrastructure Grant program on the national level, nominated SCDNR. In their nomination form, they cited SCDNR's early participation in the program and ongoing prioritization of boating infrastructure projects. Overall, SCDNR's Boating Infrastructure Grant program has dispensed over $10 million for 25 recreational boating projects across South Carolina's coastal counties. Floating docks, pump-out stations, transient slips, mooring buoys, and restrooms and showers at marina facilities have all been beneficiaries of the grant funding. Check out a list of past projects here. Any marina facility with public access in South Carolina coastal or inland waters is eligible to apply for Boating Infrastructure Grant funding, and the next solicitation for funding will begin in March 2018. Learn more here or contact program coordinator Scott Meister for more information.